Fallkniven is a small Swedish firm that has been making top-quality knives for nearly twenty-five years. Their knives are so well-regarded that they have been purchased and used by the King of Sweden himself. The company is family-owned and you get he feeling that’s very much part of their corporate identity. The founders are hunters and fishermen themselves, applying that knowledge of knife performance in the field to their own knife making process. You can go to Fallkniven’s website and check out pictures of the family who runs the operation. You’re not going to find that at a bigger, corporate-run knife maker! Fallkniven claims to make some of the strongest serial manufactured stainless steel knives in the world. It seems like a fair claim. They use only high-end stainless steels such as 3G, SGPS, and VG-10. This allows them to produce knives that are hardened well north of 60 on the Rockwell Hardness scale. Fallkniven offers a few dozen models that roughly break down into seven categories. Like with many knife-makers, there is some overlap in the categories. The Tre Kroner knives are made of 3G powdered, laminated steel hardened to 62 HRC. Their primary use is a as a hunting knife. They come in in several variations. The TK1, TK2, TK5 and TK6 are fixed-blade knives that feature contoured Cocobolo Thermorun handles with a finger guard. The TK3 and TK4 are folding knives and are available with a variety of exotic handle materials, such as mother-of-pearl, quince and jigged bone. Fallkniven folding knives such as the U1, U2, and P are smaller knives with drop points that are intended as lightweight utility hunting and fishing knives. 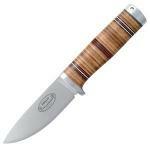 Steels used include VG10, SGPS and 3G, while handles are micarta, Cocobolo, bone or Zytel. Locking mechanisms vary as well among the various knives. 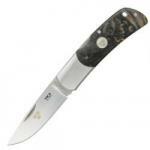 Their Hunting and Fishing Knives include the WM, the H1, the F1 and F2. 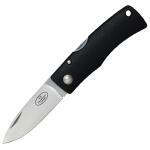 The WM is a small-game knife that is also popular among hikers and campers. 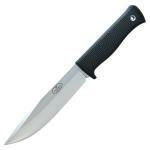 The H1, their flagship hunting knife, is a full-sized large-game hunting knife that features no finger guard. 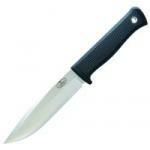 Blades are made of VG10 or 3G steel, while handles are Thermorun or Zytel. The F1 was Fallkniven’s first knife and is intended as a “survival” knife, while the F2, with it’s long narrow blade, is intended as more of a fisherman’s knife. 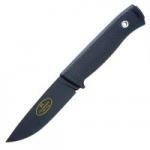 Survival and Bushcraft Knives include the S1, the A1 and the A2. These are wilderness knives that feature longer, chunkier blades. Those blades are typically 1-2mm thicker than the knives listed above, at least 30mm longer and a few points “softer” on the Rockwell Hardness scale. That makes these knives ideal for heavy-duty bushwhacking. Steel is VG-10. The handle on the S1 is Thermorun while the A1/A2 is Zytel. Fallkniven Military Knives include the G1 and the MC1. The G1 is a compact, covert knife with a non-reflective blade, while the MC1 is a huge mine-clearance knife. Both feature VG-10 steel hardened to 59HRC. The G1 features a Thermorun handle while the MC1 has a Kraton one. Fallkniven’s Chef’s Knives are a bit of a sideline for the company. 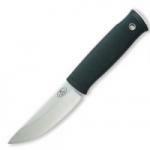 But most of the knowledge gained in making high-quality hunting and fishing knives can be applied to the kitchen as well. The K1 is a standard 8 inch Chef’s knife, while the K2 is a large Santoku knife. Both are made from laminated VG-10 steel hardened to 59 HRC and sport Thermorun non-slip handles. The Fallkniven Northern Light knives are intended for heavy-duty outdoor use. Blades are laminated VG-10 steel at 59HRC, ranging in dimension from 100mm long x 5mm thick all the way up to 250mm long x 7mm thick . Handles are stacked leather and aluminum and feature a full bolster / finger guard. The special-edition NL5cx is similar in dimension to the smallest of these knives, but features a Damascus-pattern Cowry X steel blade at a hardness of 64HRC. Fallkniven knives are readily available online, though obviously not every model will be in stock at every vendor. From one of the world's front runners in knife technology comes the Idun blade, a hunting knife that's both artistic and advanced. The H1 from Fallkniven is one of the most frequently-recommended bushcraft knives, despite the fact that it's technically a "hunting" knife and not a bushcraft knife at all. Fallkniven's Tre Kronor line is extensive, with many different blade types, materials, and colors to choose from. This particular Tre Kronor blade is an elegant retractable folder, and features a plain flat-ground blade 2.75 inches in length.